As was the case with the original, Cloudy with a Chance of Meatballs 2 is a silly film which works because of its slap-happy characters and groan-inducing puns. Realism and logic have no place in this wonderfully imaginative follow-up film to the children’s book adaptation. The characters in this film exist in a true cartoon world, where anything is possible, and this loopy approach gives the film a distinct style of humor. After the disaster in the first film, Inventor Flint Lockwood (voiced by Bill Hader) has stopped his food-making machine from overtaking the island he calls home, only to be evacuated along with all of his family and friends. Famous food scientist Chester V (Will Forte) takes over the island, claiming that he intends to help with the cleanup while actually having unsavory motives of his own. Joined by his faithful family and friends, Flint travels back to the island with hopes of saving his home and all of the food animals that have taken it over like a culinary Jurassic Park. 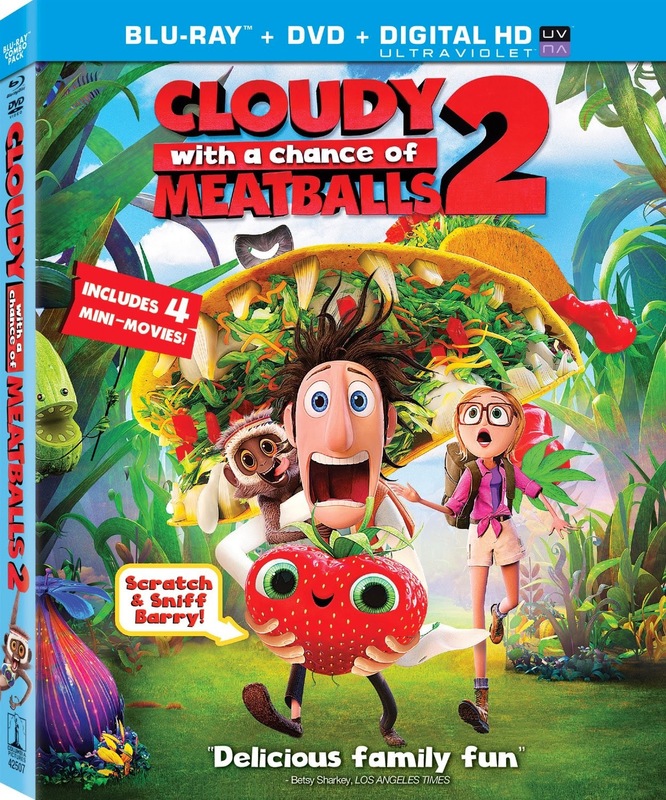 There is a lot of surface entertainment in Cloudy 2, including an onslaught of food puns and creatively constructed “foodimals,” including tacodiles, hippotatomuses, cheesepiders and more. Then there are animals whose name lends to jokes, such as the leeks in every boat. This is cleverly constructed, though it is the combination with the randomly silly humor which elevates the puns. There is far less of substance as far as plot is concerned, but the action and jokes keep coming at a pace which glosses over the shortcomings with fitting spectacle. The Blu-ray release includes a plethora of special features, including four all-new mini movies and a handful of extras exclusive to the high definition disc. The Blu-ray combo also includes a DVD and digital copy, and the DVD itself also has plenty of extras. There is a filmmaker commentary as well as featurettes on various aspects of production, including the creation of the food animals, several on the production design, animation for the credits and a making-of featurette. Many of the featurettes seem redundant, though there is no denying the quantity of extras. Exclusive to the Blu-ray is an additional interactive App for phones and tablets, as well as four additional deleted scenes.